EiE Nigeria, Paradigm Initiative Nigeria (PIN) and BudgIT will host the ‘New Media, Citizens & Governance Conference‘ from Wednesday, October 26 – Thursday, October 27 in Abuja. EiE first co-hosted a ‘New Media and Governance Conference’ in 2012 to bringing together policy makers, civil society, academic institutions, private sector, and youth to explore the use of new media for improved governance, accountability and civic engagement. This year’s conference will build on the 2012 conference with a particular focus on ‘citizens’ as the bridge between the new media tools and governance outcomes as various sessions examine the rights and responsibilities that come with freedom of speech and access to the internet. The conference will open with a welcome address by Mallam Nasir El-Rufai, an avid Twitter user and the Governor of Kaduna State; and a keynote address by Mrs Oby Ezekwesili, a former Minister of Education and a fierce advocate of the ‘Office of the Citizen’. Advocacy and New Media – which will look at the intersection of social. Speakers include JJ Omojuwa, Mrs Joe Odumakin (Women Arise – invited) & Aisha Yesufu (BBOG). New Media and National Orientation – which will look at the role of media in citizens’ education. Speakers include Musikilu Mojeed of Premium Times, Chidi Odinkalu of the Open Society Justice Initiative & Dr Garba Abari of the National Orientation Agency. 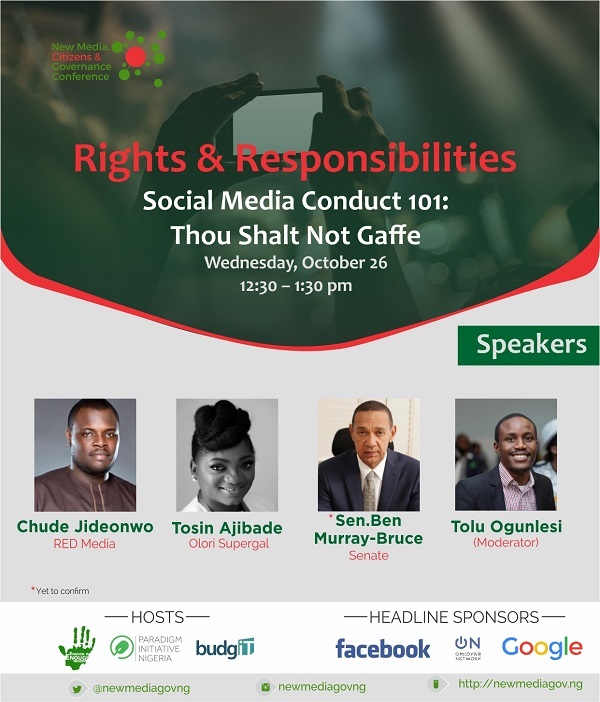 Social Media Conduct 101: Thou Shalt Not Gaffe – which will look at how to avoid common blunders and mistakes on social media. Speakers include Tolu Ogunlesi & Chude Jideonwo. New Media and Elections – New media continues to play a crucial role in elections on the content and panel members from Nigeria, Uganda & Kenya will look at actions, lessons learnt and suggestions for better engagement. Speakers include Amara Nwakpa of the Shehu Musa Yar’Adua Foundation, Chuks Ojidoh of Reclaim Naija & Fatu Ogwuche, an Elections & Technology consultant. Engagement Unusual – which will look at unconventional uses of new media to share messages & engage. Speakers include Subomi Plumptre of Alder Consulting, Femi Falodun of ID Africa & Bobrinsky, the Instagram sensation. Managing Social Media Accounts for Public Officials – which will discuss how public officials’ social media accounts reflect the thoughts of its owners. Speakers include Ayeni Adekunle of BHM, Tolu Ogunlesi, Rinsola Abiola, Banks Omisore, Salihu Yakasai & Esther Agbarakwe. Headline sponsors Facebook and Google will be active participants in the conference. Visit the website www.newmediagov.ng for conference agenda, details of speakers and other information. Pre-registration closes on Tuesday but walk-in registrations are welcome. It promises to be an engaging conversation over 2 days.